Above Image: Actor James Getty protraying Abraham Lincoln at the Dedication Day Ceremony for the 150th Anniversary of the Gettysburg Address. November 19, 2013 - Each year the anniversary date of the Gettysburg Address reminds us of the importance of those 272 words. On the 150th anniversary of that date, it takes it to a whole other level. Ten thousand visitors thronged the chairs and grass surrounding the rostrum of the Gettysburg National Cemetery on a cold and blustery day, not unlike that of Lincoln's time. And as the speakers who graced the platform, including Senators Toomey and Casey from Pennsylvania, the state's Governor Corbett, plus keynote historian James McPherson, gave words to honor both the fallen and the words of the President who would commemorate the cemetery in 1863, the actual words, later spoken by Jim Getty portraying Lincoln himself, became magnified. Simple. Concise. 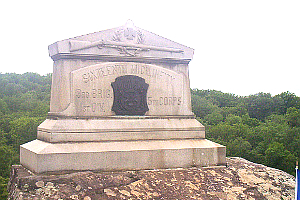 Conceived in the middle of the most costly war in the nation's history. This is one ceremony that if you have one ounce of either patriotism or history buff inside you, you should get to some year. This year for many in the crowd, on the first or one of many, was a special time to do so. For us and others we spoke to, the most important and poignant moment of the dedication came near the end, after the disappointment of President Obama's absence had waned into memory, as Antonin Scalia rose on the platform. Yes, the Supreme Court Justice, gave some fun and appropriate remarks, then the oath of citizenship to sixteen new Americans. Can there be a more special place to be given citizenship to the United States than in the cemetery where Abraham Lincoln had given the Gettysburg Address, on the 150th anniversary of that event, with a Supreme Court Justice behind the invocation? Just wonderful! And for the crowd who watched in reverent awe, they likely realized the same thought that knocked through our minds as it occurred. Park rangers, who had seen many of these events and speakers of note in the past, stated the same thing after the ceremony as well. It is a rare occurence to be at a ceremony where a Supreme Court Justice presides, even more rare than one with a President in tow. And to be accepted into the nation at the same time we consecrate those that protected our freedoms and nation 150 years earlier, is something none of those who were there will soon forget. November 19, 2013 - An estimated 10,000 visitors watched the Dedication Day ceremony, either in the cemetery itself, on a large video screen erected across the street at Meade's headquarters, or downtown at the Majestic Theatre. This likely eclipsed the previous high, one year earlier, when Steven Spielberg and Doris Kearns Goodwin were the keynoted speakers. 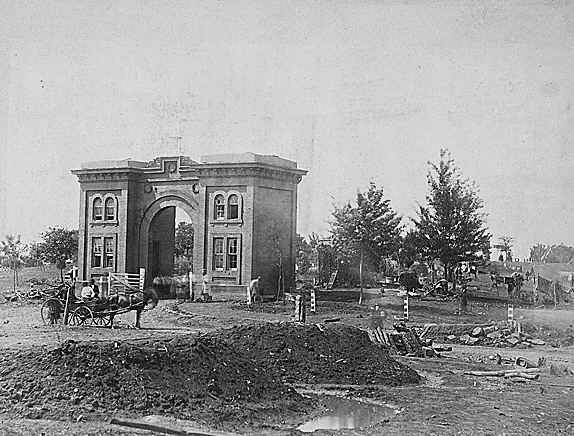 Cemetery Gate - The gate to Evergreen Cemetery, showing the devastation of battle (photo below). This gate, still present, is to the town cemetery at the time and the location for the actual Gettysburg Address. The National Soldiers Cemetery is located directly to the west, or right, of the gate. 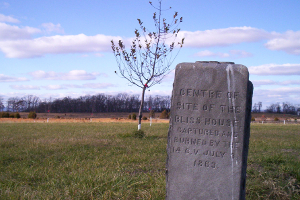 The Bliss Farm - Actual location and stone of the Bliss Farm on Pickett's Charge, Gettysburg National Military Park (photo below). The Bliss Farm was burned, both home and barn, during the Battle of Gettysburg, to rid the field of a hiding place for Confederate soldiers prior to Pickett's Charge. Located along Long Lane today, a bit off the normal path for visitors, but worth a look. Photo above: The rostrum at the 150th ceremony of Dedication Day and the Gettysburg Address as the various speakers addressed the audience, including Chief Justice Scalia. 1. Dedication Day Ceremonies. 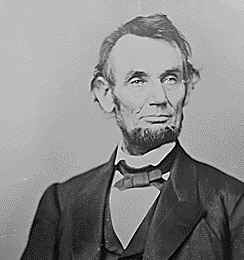 Held on the exact day of Lincoln's Gettysburg Address, 150 years hence, and held every year on this date for those that wish to come in the future. The ceremony includes a wreath laying ceremony honoring those who fought and died in the battle, speeches by dignitaries and keynotes, this year by historian James McPherson and Secretary of the Interior Sally Jewell, music from the Lincoln Band, the United States Marine Band, and others, and a naturalization ceremony for new citizens with Supreme Court Justice Antonin Scalia at the helm. This yearly event is a grand reminder of the power of Lincoln's 272 words. It's usually a bit cold at this time of year in Pennsylvania, dress accordingly if you come and get there early for a good seat. Photo below: The crowd awaiting the Dedication Day ceremonies to begin in the Gettysburg National Cemetery. 2. The Bliss Farm and Journey Through Hallowed Ground Project. During the afternoon of Dedication Day this year, a unique project bridging the historic sites between Monticello and Gettysburg was begun. It includes the planting of 700,000 trees, one for each fallen soldier of the Civil War, along the trail of historic sites in that corridor. Attached to each tree is a tag with one of those soldier's names and details about his life. School children, in association with Ancestry.com, researched those on the Gettysburg trees, and noted them within the ceremony, serenaded by the West Point Alumni Glee Club. The ceremony was held at one of the unique locations on the battlefield, little found by most due to the fact that the Bliss Farm, fought for and through during July 2 and Pickett's Charge on July 3, was burned to the ground and shows no remnants until you walk through the fields to the stone marker that marks the site. Photo below: The grandchildren of David McCullough, famed historian, dedicating a tree during the ceremony. 3. An Evening History Walk for the Ages. 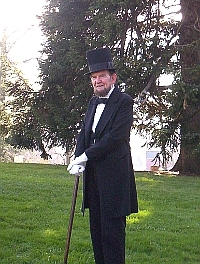 After most of the crowds subsided from the dedication ceremonies, town historians walked a group of 200 Civil War fans in the Footsteps of Abraham Lincoln during his stay. These are always a highlight for us, as the historians give such insight and depth into the situation. Starting at the Gettysburg Train Station, in the same room Lincoln came through on November 18, to the Will's House where he stayed the night, then up Baltimore Street past courthouses and churches that witnessed the parade to the cemetery the next day before the Gettysburg Address was given and the trip back thereafter. 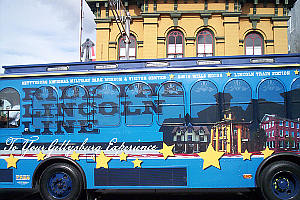 A few facts from his stay: Lincoln had his own room (you can visit it, the same bed, and even the same bedding), he rode a horse to the cemetery (it was too short for him), and there's a bench in the Presbyterian Church where he and John Burns (the only citizen, 69 years old, who took up arms and fought beside the soldiers) sat on the night of November 19. November 19, 2013 - Check out the composite videos from the National Park Service about the anniversary events of the year. Other coverage of the event: ABC News. 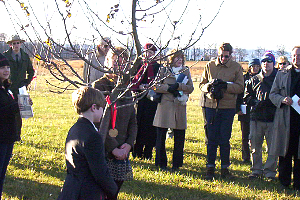 Photo above: The grandchildren of David McCullough, famed historian, dedicating a tree during the ceremony for the Journey Through Hallowed Ground Project, which includes planting one tree for every casualty of the Civil War from Gettysburg to Monticello. If you come in the future to Dedication Day and the Remembrance Day or weekend festivities, beyond those mentioned above, make sure to stay around to see the Remembrance Day parade. This is not always held, actually not usually, on November 19, but on the nearest Saturday to that date. 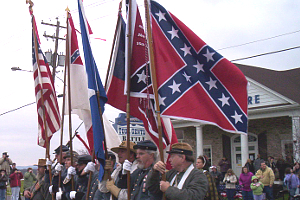 Five to ten thousand reenactors march through the streets of Gettysburg in a resplendent display of honor and pageantry. During this same weekend, the reenactors also show up, often unannounced, at the monuments to the regiments they portray, for meangingful ceremonies honoring their sacrifice. When you drive around the field, you'll see them standing around the monuments; join in, they'll welcome you, and you'll enjoy it. Photo above: Confederate reenactors during the Remembrance Day parade as they walk down Steinwehr Avenue near Pickett's Charge, Gettysburg National Military Park. 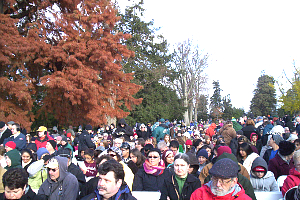 Crowds of people waiting for the 150th anniversary ceremony of the Gettysburg Address to begin. Ceremony is held in the National Cemetery directly next door to Evergreen Cemetery where Lincoln's address was originally given. ©2019 Americasbesthistory.com and its licensors. Template by w3layouts.